It was a cold Friday night in Sydney. There we were: Nina, her mum Karen, Garth, Mr NQN and I at a pub. The smell of the food wafting from the kitchen was great but alas there wasn't much vegetarian on offer. So Nina and I were scrambling on our phones for somewhere closeby to eat. It also had to be cheap and cheerful and fast and within one suburb's distance from us in Paddington. 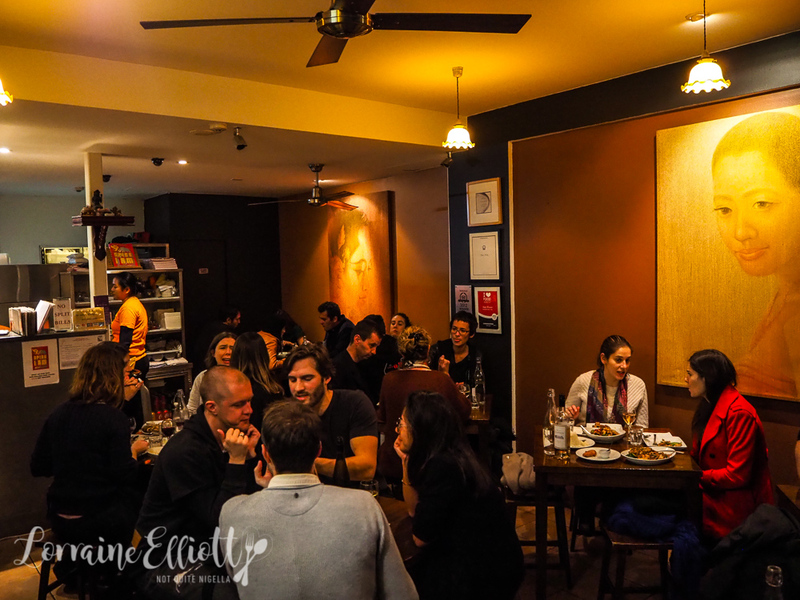 And that's how we ended up at Spice I Am in Surry Hills. There's always a queue outside Spice I Am and we are the third on the wait list. Before long the five of us are crowded around a table I think is meant for three or four but we're seated and warm and we order quickly. It's all about fast turnover here with tables so the food arrives very quickly. The atmosphere really does remind me a bit of being in Bangkok (except for the winter temps). When I saw that there was a menu of five ka nom jeens I became a bit excited. It's a popular street food in Bangkok usually eaten for breakfast. It's a noodle dish made out of fermented rice vermicelli which is pounded with a large mortar and pestle. Their signature one is served with a fish curry coconut sauce which is pretty delicious. There are other sauces available like a hot southern curry or a peanut sauce of a coconut less fish curry. 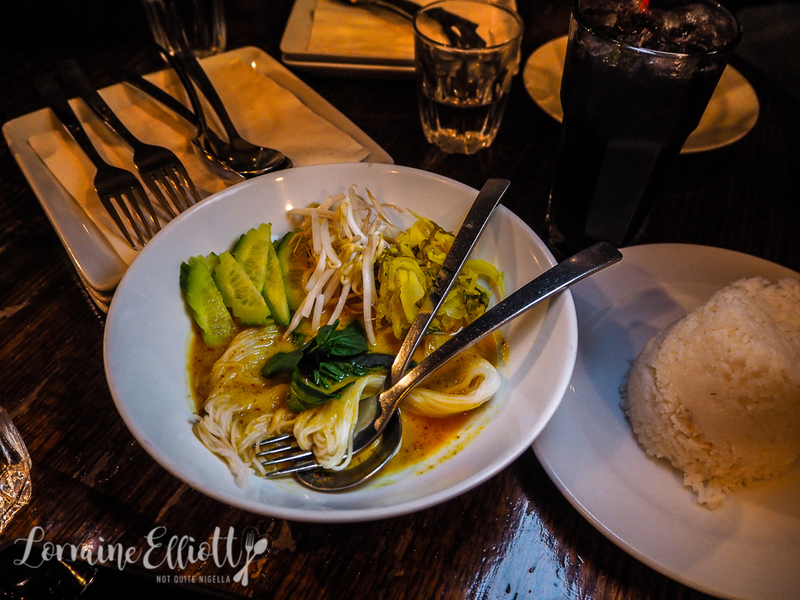 Having only recently been to Phuket I was excited to see some Phuket style dishes here. 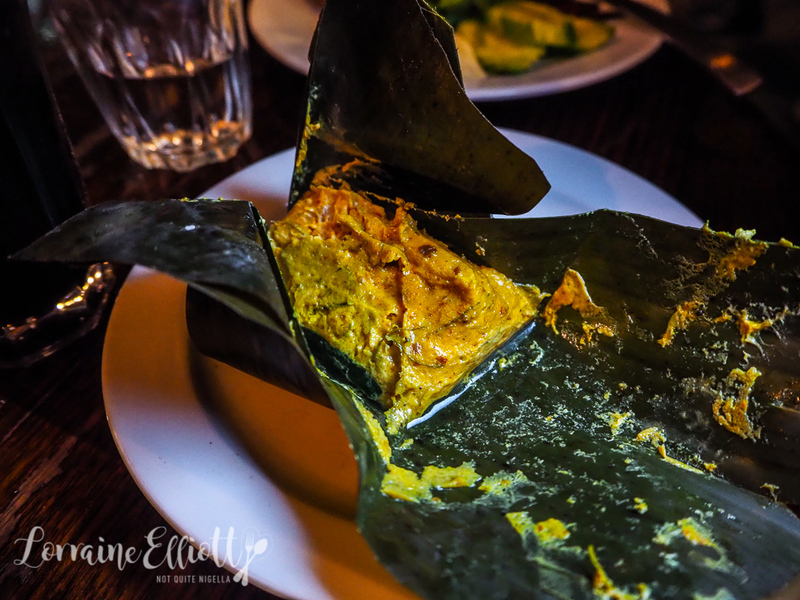 We order the Ho Mok, similar to an Amok in Cambodia which is like a steamed fish curry mousse wrapped with banana leaf. It's delicious and light with the flavour of fish, coconut and spices although pretty pricey for the size. I love tamarind flavoured items and in Thai cooking they sweeten it to balance the sour flavour. 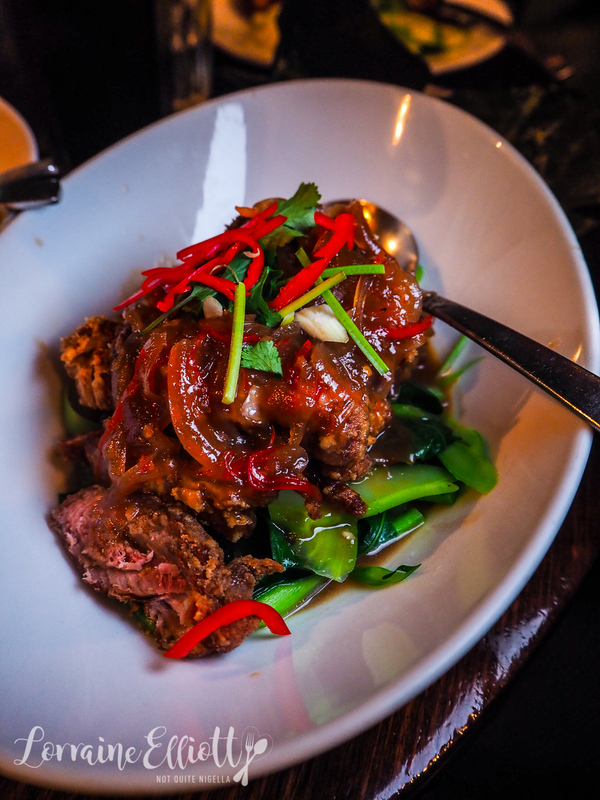 These prawns are butterflied, battered and deep fried in a sweet tamarind sauce. The sai krok isaan is from the trip to Chiang Mai a few years ago. I became quite besotted by the Northern region's sausages and intense spiciness. 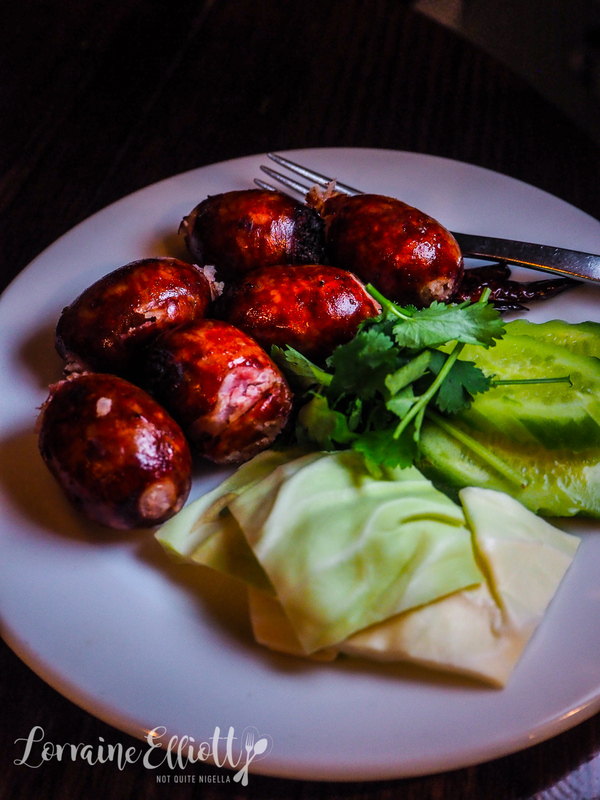 These are fragrant Issan sausage made from pork, garlic, coriander and cooked rice and they come with tiny, hot chillies, cabbage and cucumber. 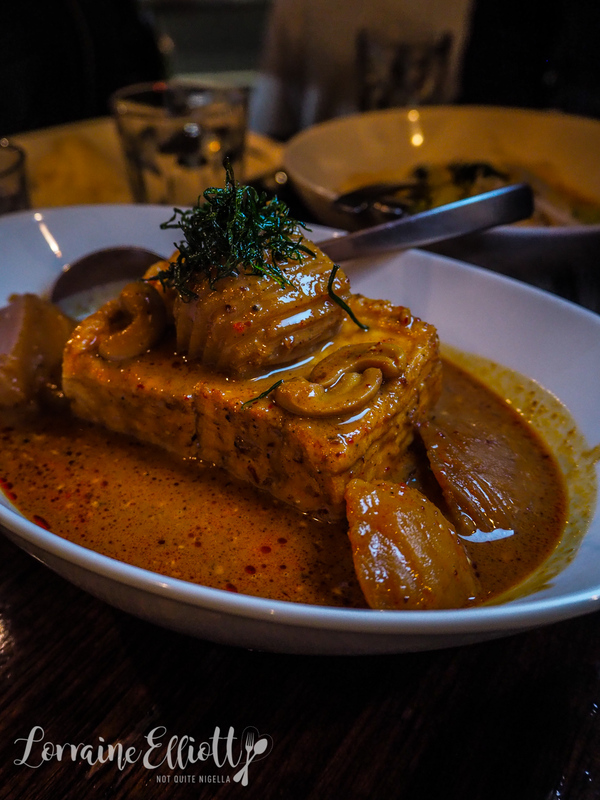 Nina and her mother aren't particularly hungry so they order a dish to share and it's an enormous block of tofu with soft, whole shallots and a rich massaman peanut curry with a tang of tamarind and aromatic spices. The last dish to arrive is the spicy fried rice with chicken. 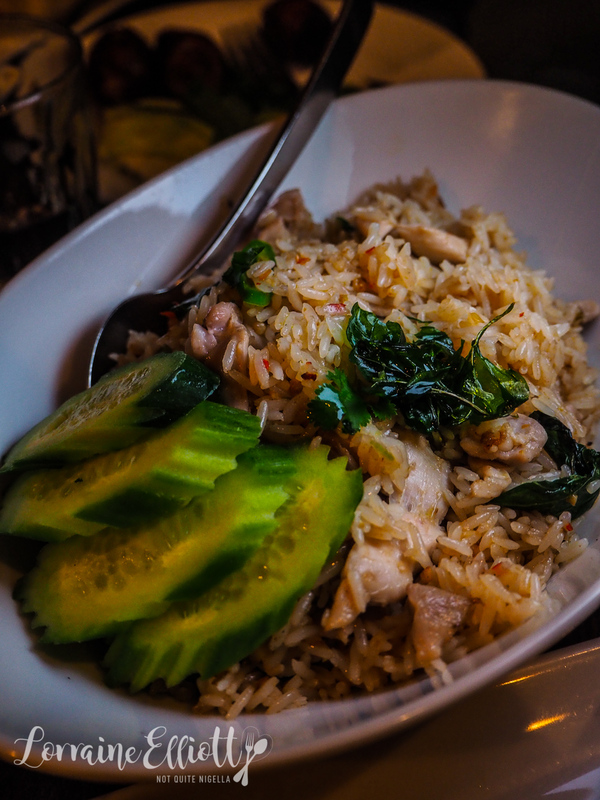 It's a simple fried rice with garlic, chilli, holy basil and plenty of chicken pieces. It arrives a bit too late to enjoy with the rest of the dishes though. And when I say it is all about turnover it definitely is with our finished plates being whisked away and replaced with the bill! So tell me Dear Reader, do you look for food that you've eaten overseas? And do you plan your meals out or do you find yourself frantically searching on your phone?